Work on 13th Street in Paso Robles as of April 15. 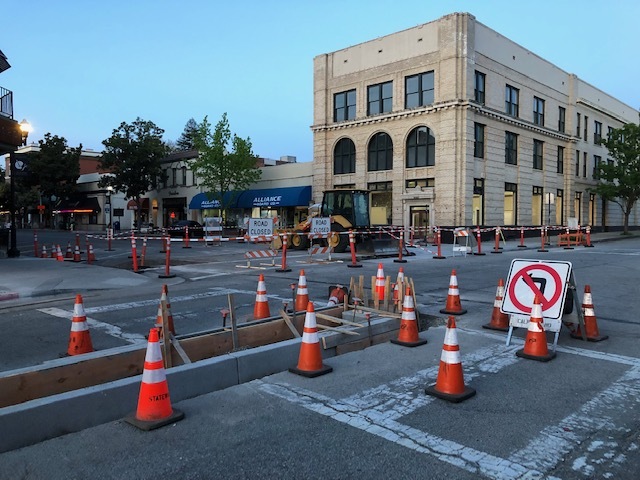 –The work to install lighted pedestrian crosswalks is progressing on 13th Street in downtown Paso Robles. Ditas Esperanza of the Paso Robles Public Works Department says the work at Pine and 13th is 95-percent complete. She says there are still some ornamental lights and pedestrian push buttons that need be installed. The work at 13th and Park is progressing. The ramps are mostly complete from the sidewalks on the north side. The planters areas are nearing completion. They are also responsible for installing eight ornamental lights, four at each intersection. They will also repave 13th between Riverside and Spring. Beginning Monday, April 15, the construction crews will be working on the south side of Park and also on Pine Street to install push button poles on the island medians. Motorists are advised to drive carefully on 13th Street between Riverside and Spring Streets.